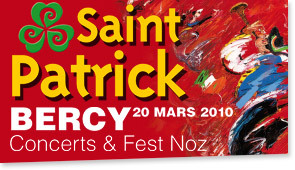 Join the Saint Patrick Day celebrations at Paris Bercy. On Saturday March 20th enjoy over 3 hours of the best celtic music from famous bands from both Brittany and Ireland. Breton and Irish dancers will accompany the groups and lead the audience in an evening full of traditional Irish dances.